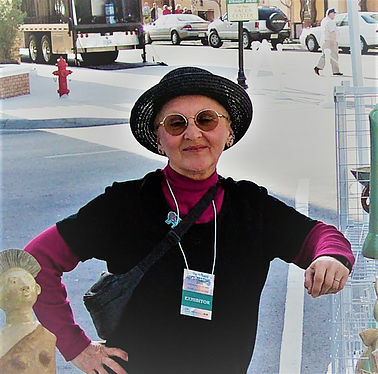 Marilyn B. Cisek (Chonko) received her formal education in the Arts with a BA from UCONN and post graduate studies in Fine Arts at USC and Old Dominion. After college she studied abroad with artists in Japan and North Africa. In the sixties she designed knitwear and needlework kits for Knit Wit of Southern California and taught extensively in the Southeast and on the Gulf Coast. She received on the job training with the best and brightest at Creative Arts Workshop, Farmington Valley Art Center, Brookfield Craft Center, and Guilford Handcrafts Center in Connecticut. Her award-winning work has been exhibited in such venues as the Cheeseborough Pond Gallery in Connecticut, the Williamsburg Gallery in Virginia, On the Hill in Yorktown, Studio 21, twentieth Century Gallery and P. Kanes in Iwakuni, Japan. Marilyn was a vibrant part of the Brookfield Craft Center Community for a number of years and held the institution close to her heart. While her own creative endeavors and life led her out of Connecticut, she often spoke fondly of the time that she spent on BCC’s historic campus. In accordance with her wishes, her husband, William has made a significant gift to the Craft Center in her memory.